Anchorage Condos are lakefront condos for sale in Dillon Colorado Real Estate. 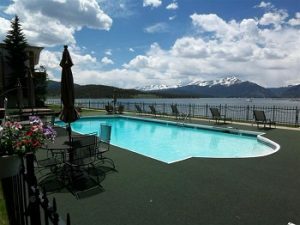 These Lake Dillon condos were built in 1970 and are some of the most sought after condos in Dillon Colorado. There are 30 units in the Anchorage Condo complex which is comprised of 20 – two bedroom condos and 10 – four bedroom condos. Each Anchorage condo has incredible views of Lake Dillon from their living rooms and oversized balconies or patios. Located off of Tenderfoot Street, Anchorage Condos are only a short walk to the shops, restaurants, amphitheater, bowling alley, summer farmers market and marina in Dillon CO. Anchorage Condos have an on-site outdoor pool in the summer and year round hot tub with views of Lake Dillon and the surrounding mountains. If you are looking for a condo in Dillon CO Real Estate with incredible views, Anchorage Condos are a must see.